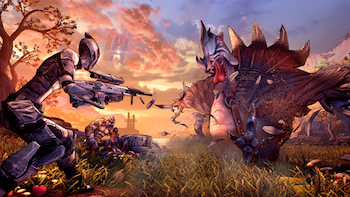 Borderlands 2: The Horrible Hunger of the Ravenous Wattle Gobbler channels the Thanksgiving spirit with friends, family, turkey and... guns. Lots of guns. Looking for an excuse to celebrate Thanksgiving by playing a video game? Well you've found it. The answer? 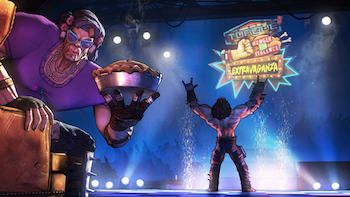 Some new turkey day-themed DLC for Borderlands 2 called "The Horrible Hunger of the Ravenous Wattle Gobbler" coming out just in time for the holiday. Of course, it wouldn't be a real Thanksgiving story if it wasn't about family, so Mr. Torgue's grandmother, Grandma Flexington, is getting in on the action. By getting in on the action, I mean she's there to terrify you with her massive muscles. On the other hand, she did bring pie... I bet she's nice. Publisher 2K Games also announced that the third Headhunter DLC, "How Marcus Saved Mercenary Day," will be coming out next month. "The Horrible Hunger of the Ravenous Wattle Gobbler" will hit Xbox 360, PS3, PC and Mac November 26.